DETENT VALVE 1.5" NH X 1.5" NH (38mm x 38mm) Separate ball-type shutoff valve with a 1-3/8" (35mm) waterway for use with tip only nozzles. Includes six detent flow positions. Colored handle covers available. 1.5" (38mm) NH rocker lug full-time swivel coupling, and 1.5" (38mm) NH male outlet standard. All lightweight materials. Accepts F140SBI smooth bore insert kit found on page 49. DETENT VALVE W/GRIP 1.5" NH x 1.5" NH (38mm x 38mm) Separate ball-type shutoff valve with a 1-3/8" (35mm) waterway and a built-in pistol grip mounted below the valve body for use with tip only nozzles. 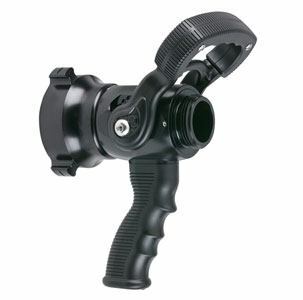 Six detent flow positions, optional colored pistol grip and handle covers, 1.5" (38mm) NH rocker lug full-time swivel coupling, and 1.5" (38mm) NH male outlet standard. All lightweight materials. Accepts F140SBI smooth bore insert kit found on page 49. DETENT VALVE 2.5" NH X 1.5" NH (65mm x 38mm) Separate ball-type shutoff valve with a 1-3/8" (35mm) waterway for use with tip only nozzles. Includes six detent flow positions. Colored handle covers available. 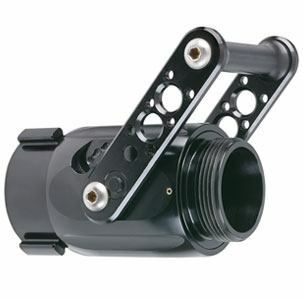 2.5" (65mm) NH rocker lug full-time swivel coupling, and 1.5" (38mm) NH male outlet standard. All lightweight materials. Accepts F140SBI smooth bore insert kit found on page 49. DETENT VALVE W/GRIP 2.5" NH x 1.5" NH (65mm x 38mm) Separate ball-type shutoff valve with a 1-3/8" (35mm) waterway and a built-in pistol grip mounted below the valve body for use with tip only nozzles. 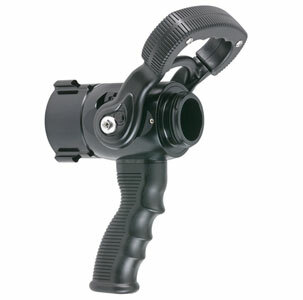 Six detent flow positions, optional colored pistol grip and handle covers, 2.5" (65mm) NH rocker lug full-time swivel coupling, and 1.5" (38mm) NH male outlet standard. All lightweight materials. Accepts F140SBI smooth bore insert kit found on page 49. DETENT VALVE 2.5"NH x 2.5"NH (65mm x 65mm) Separate ball-type shutoff valve with 2" (50mm) waterway for use with tip only nozzles. 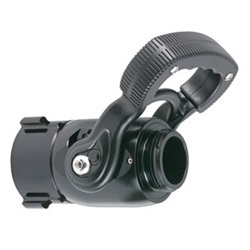 Includes six detent flow positions, 2.5" (65mm) NH rocker lug full-time swivel coupling, and 2.5" (65mm) NH male outlet standard. All lightweight materials. 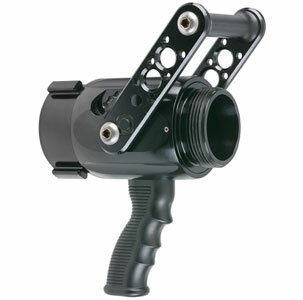 DETENT VALVE W/GRIP 2.5"NH x 2.5"NH (65mm x 65mm) Separate ball-type shutoff valve with 2" (50mm) waterway and a built-in pistol grip mounted below the valve body for use with tip only nozzles. Includes six detent flow positions. 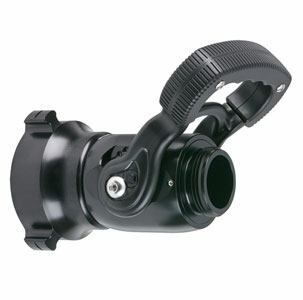 2.5" (65mm) NH rocker lug full-time swivel coupling, and 2.5" (65mm) NH male outlet standard. All lightweight materials. TFT Detent Valve w/ grip 2.5"
TFT Detent Valve 2.5"NH x 1.5"